The 3am Teacher: COMING SOON: HELLO PLANNER!!! Hi everyone!! I just wanted to share a little somethin' - somethin' with all of you!! I know it has been quite a while since I have published a new clipart set. Aside from dealing with the site that is stealing clipart from all over the place without permission, I have had some personal trials to work through as well. My TpT monthly shop sales hit a new low.... the lowest monthly sales I have had in over two years, which was very discouraging for me. If you haven't noticed - I do not like to fail and I really do not like to fall. I know that with time and LOTS of work dedication, and prayer. my sales will pick up and ever growing bills won't be the hot topic revolving in my head. I feel terrible for even mentioning the stress.. as it is nothing compared to what some of the families are going through on the east coast of the United States. My prayers and my heart goes out to all of you!!! BUT I'D MUCH RATHER YOU LOVE ME!! I am almost finished with an amazing planner that I think all of you TpT'ers will LOVE and greatly benefit from!! I created a year long planner filled with everything anyone would need to keep their home business on track and organized!! I am so excited that I can hardly even take time away form my computer lately to take a break, but I am planning to launch this "puppy" by next week!! I focused on creating a planner that was UN-like any other planner and FULL of templates, printables, and resources with a cute creative edge. I think I have accomplished what I set out to create over a year ago.... YES, I started this project over a year ago!! I hope that all of the times, planning and creativity will be a "can't live without" tool for many of you. 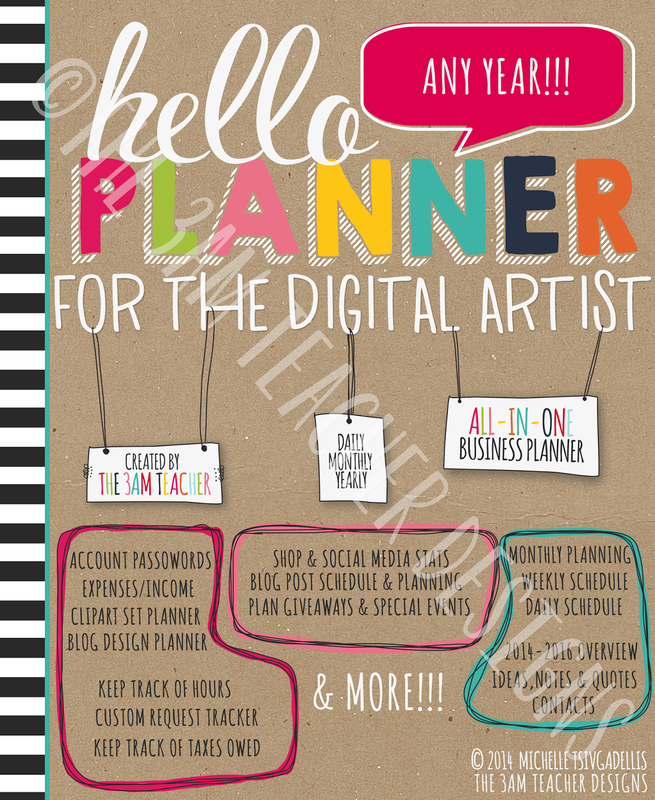 I will have a few versions available after I launch the planner specifically designed for digital artists. I did include teaching resources because I know a lot of you teach and run your online businesses!! Below is a little sneak preview for you to get excited about!!! I would love to read your initial thoughts or any ideas you might have before I am finished with this planner. I LOVE hearing from all of you!! I will also have a fun design set and some freebies for all of you once my new planner is published!! I am literally jumping up and down like a 5 year old. Thank you for stopping by & I hope you all have a wonderful weekend!!! CAN… NOT…. WAIT! I've been meaning to set up a new planner but can't seem to find the time to rebuild it to suit my new needs. This is PERFECT! Thank you so much!! I can't believe how long this has taken me, but I am hoping it will be worth it. I can't wait to see your planner, because my goal is to really get myself organized! My past two months have been a personal and professional struggle as well, and I just keep "swimming toward the light and telling myself that SUMMER is coming! Keep the faith and keep creating! If the rest of the planner is as cute as the cover then I totally can't wait! Designing my own has been on my list as well, but if yours covers all the bases I was planning to then I'm all in!!! Congrats on completing such a huge project!!! I was thinking about doing a couple of versions, but now that I am reading everyone's posts, I think I will include everything in the one version and people can choose to not print the sections they don't need. I can't wait to see this Michelle! I need a planner sooooo badly! I LOVE the cover and your doodle graphics! Thank you girly!! I wanted to do something completely different. No I am even more determined to get it finished this weekend!! Very cute! There's something about a planner that really gets me excited. I haven't yet found one that keeps me inspired and reduces my workload at the same time. I like the idea of just printing out the pages that we need - I love options! Please keep us updated. And on a side note, keep swimming - things will turn around soon! WOW! It looks like what I had going on in my head and I can't wait! I started to do my own las summer (Not nearly as cute as yours) and I didn't get very far, so I get the effort and time you had to have put into this. I am in desperate need of a organizer for my life! Thanks for what you do and I am sorry for the distractions from "selfish" people that you had to deal with.